As if you didn't already know, the Hearthstone: Heroes of Warcraft beta launched today, and like any geek worth her salt, I immediately downloaded it and started playing. So I thought I'd give you a brief run-down of the tutorial process and the like. 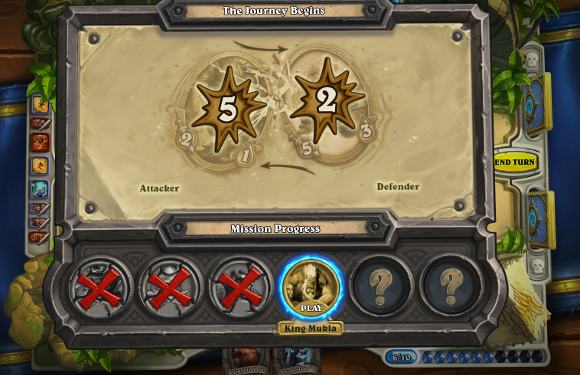 You start off with a mage deck, as you load into the game, you have a very dwarven-sounding voice announcing that a new hero has appeared, Jaina Proudmoore. 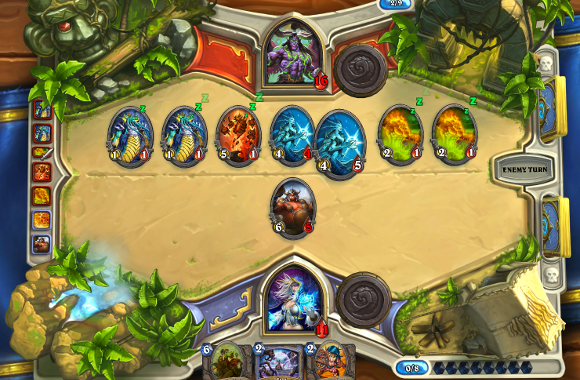 She's the character behind the mage deck, and the tutorial starts you off slow, taking on Hogger. The tutorial is really well constructed and doesn't hold your hand too much, just points out key elements as you go through it with little tip popups. As you progress through the tutorial, you're issued with free cards on every win, of which there are several, and these are added to your deck. You don't get anything amazing, but we''ve heard on several occasions how great pains have been taken to ensure that these cards are just as powerful as the higher level ones. As you can see above, you're working through missions, and as you go through each one, you're learning a small additional aspect of the gameplay. The first one deals with simple damage dealing, then Milhouse Manastorm appears to teach you about, well, mana management. As you go, you're always being informed of things like the rest period when a card without Charge is played, or how a Battlecry works. You'll also learn how attacking a minion with your own minion causes both to take damage, from Lorewalker Cho, as well as learning to use taunt cards from King Mukla. 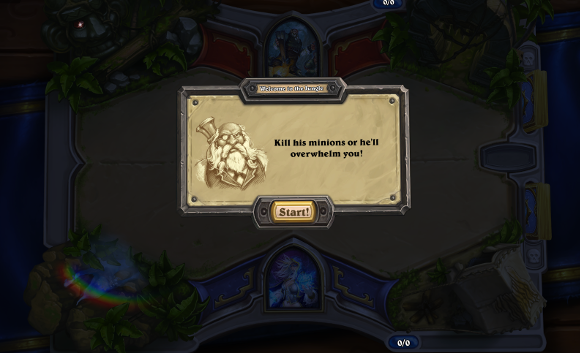 Hemet Nesingwary appears next, to fill you in on how to deal with different types of minions, and how to effectively damage past them, as well as use hero abilities. 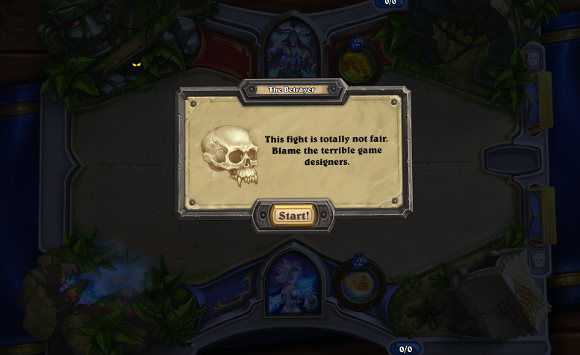 He's followed by your epic final battle of this stage of the tutorial, where you're taking on Illidan Stormrage, and I have to show you the screen splash before the fight begins. Illidan, being the crafty beggar that he is, will really put your new-found knowledge through its paces, and all the while, Jaina will be there with helpful tips, like how you should focus your damage on Illidan, not on the minions. Given the splash above, I thought it might be one of those fights which you're just going to lose anyhow, regardless, and Illidan does seem to have quite the penchant for minions, as can be seen here, but I did eventually prevail, probably doing terribly badly, and still emerged victorious. After completing the tutorial you have several options. You can head back into Practice Mode to take on more AI characters and unlock more heroes, or you can dive into the deck builder and create custom decks for heroes you have already unlocked, to use in your AI matches. 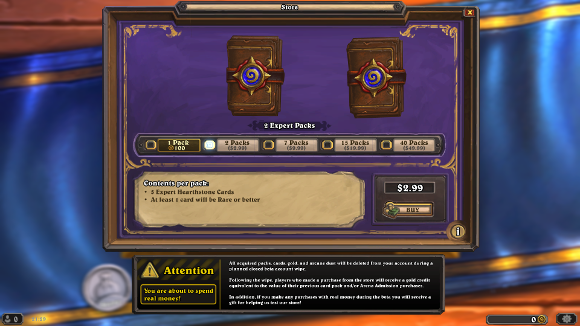 You can also head over to the store and pick up some Hearthstone card packs in return for either in-game gold or real money, with 2 packs starting from $2.99, 7 packs at $9.99, 15 packs at $19.99, or 40 packs at $49.99. 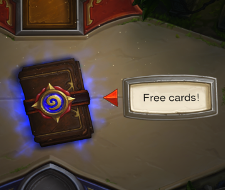 There is a big banner to warn you that you are actually spending real money, and to inform players that all packs, gold, and arcane dust will be deleted from your account during a beta account wipe, and urging caution. Altogether, the initial tutorial was a great balance of providing information when you needed it, but not holding your hand. I'm waiting with bated breath to get back into the game and do some more AI matches in the practice mode and unlock more heroes to play with in the deck builder, and of course to tell you all about it!